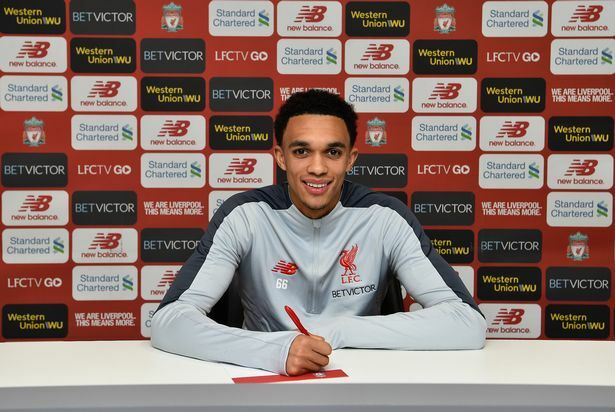 It was good news for Liverpool on Friday as they successfully elongated the contract of their young English defender, Trent Alexander-Arnold a couple of days after handing same to Scotland captain, Andy Robertson. They both have been impressive for Jurgen Klopp and the fans, and their contract goes a long way to show how hugely appreciated the club is of them. Alexander-Arnold, 20, joined the Reds academy while still just six and has managed to be in the first team through sheer determination, hard work and consistency. Last season saw him feature at the biggest stage of European football when he played against Real Madrid in the champion league final in Kiev. Also, his performances for club earned him an invitation to star for England at the World Cup, where he scored a goal against United States. This season has seen him feature 22 times for Liverpool scoring ones through a sublime free kick against Watford. Although side-lined, the impressive right back has brought stability and consistent output whenever he has been selected to do a job. Speaking to the club’s official website about the new contract, the 20-year-old said: “I’m ecstatic and really proud. I feel privileged to have the support and the trust the club has in me to offer me a new deal. We hope so too and congratulations to you as we pray you get back to the field soon.